Vertical Blinds With Embedded LEDs Make For A Cool Effect | OhGizmo! As someone who relies on vertical blinds to keep his home in a constant cave-like atmosphere, I can see the benefit of this Solar Vertical Lamp concept designed by Yoon-Hui Kim and Eun-Kyung Kim. 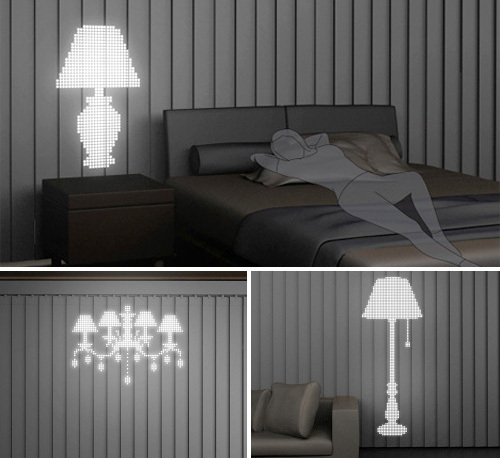 The vertical blinds are embedded with a matrix of white LEDs which can be illuminated to produce glowing lamp-like shapes. Obviously the effect looks pretty cool, but the LEDs are also powered by a battery which is recharged by the sun during the day since the outward facing sides of the blinds also serve as solar cells. In theory the blinds should be able to provide plenty of ambient light during the night, without adding any costs to your electric bill. Very creative, one for my room please.